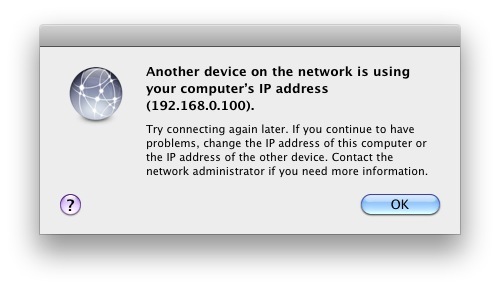 This is a rather strange error message which you may see in Mac OS X, you’ll get the notification “Another device on the network is using your computer’s IP address” and then you’ll lose internet access with the dialog box telling you to try connecting again later. No thanks, we need internet access now! So what causes this and how do we fix it on a Mac in OS X? It looks to be a problem with the DHCP server, which mistakenly assigns the same IP address to two devices, but don’t blame your router quite yet. For whatever reason it seems that another Mac, or the iPod touch, iPad, and iPhone is often the culprit. Apparently these iOS devices like to maintain the same IP address and will attempt to force themselves onto the same IP that they had previously been assigned, which can lead to the error message. 1: The easiest solution is to just reset the router, but that can be a pain depending on your access to the router itself. 2: If resetting the router is a no go, you can also try torenew your DHCP lease in Mac OS X either through the command line (as the linked article shows) or through the Network settings System Preference panels as described here. 3: The other option is to manually set an IP address to a static IP and have the IP range be far enough apart so that the devices do not conflict. Why does this error show up at all? I assume this is just a bug with how iOS interacts with certain routers DHCP management, it happen to Apple’s own Airport too so perhaps that will spur a patch sooner than later, but by no means is this limited to Apple routers, and you can encounter it on any wi-fi network (and even some wired networks too). In the meantime, try one of the fixes, they should get your Mac back online in no time. Another possibility (although much less likely) is that someone has managed to spoof your MAC address and IP and is attempting to gain access to your network. I say this is much less likely because assuming you have some reasonable wireless security precautions in place this is very unlikely, there simply aren’t that many people out there with the knowhow to crack into a secured wireless network. The other reason this is less likely is because this problem can be semi-reliably reproduced by simply rebooting an iOS device on a network with only 1 IP assigned (usually 192.168.0.1 or similar). Bottom line: if you see the ‘Another device has your IP’ error message, don’t freak out, it’s probably not a security breach, and it’s probably a very simple fix. A device cannot ‘force’ a DHCP server to use the same address. If a device has the same address over and over it’s because the lease didn’t expire yet or because the DHCP server remembers the device and tries to reassign the same address. If a DHCP server hands out double addresses that’s not because the device wants it but simple because your DHCP server fails. A reboot often helps but that’s a workaround. You should consider using another DHCP server if such things happen often. Say once every few days or more. Using a drive image to set up several computers on a network can result in the same ‘computer name’ in the Sharing system preferences for several computers. Some DHCP servers expect unique computer names to assign different IP addresses. Finding the same name, the server has no choice but to try to assign the same address to the machines with the duplicate names. Each new login attempt produces the ‘same address’ error message and/or kicks the other user off the network. The usual remedy is to either assign a unique computer name to each device or no name at all so the server will default to using the computer’s MAC address to determine identity. (1) Turn on your modem and your router first, and wait until they have talked to each other and your router has a steady green light. (2) Turn on your computer. (3) Click on your Applications folder. (4) Inside the Applications folder, click on the Utilities folder. (5) Inside the Utilities folder, click on the AirPort Utility icon. (6) One of the window panes at the left side of the AirPort Utility display should show your router with a green light. (7) Double click on the pane that shows your router. (8) Click on the Internet icon. (9) “Internet Connection” should be highlighted (rather than “TCP/IP”, etc.). (11) Click on the “Update” button, and then click on the “Continue” button. (12) Close AirPort Utility and — most important — restart your computer. With any luck at all, AirPort will behave itself now, and you will be able to connect to the Internet. I’ve been trying to solve this problem for a few days now, and your solution was the one that finally worked. Thanks much! Thank you so much!!! You’re instructions worked! I have a linksys router and a cable modem. I cannot use the airport utility. (It doesn’t find a modem). Any other ideas? I get this message once a week or so. I also am having problems with my internet connection cutting out off and on. It then allows me to change the last segment of the DHCP Address, but doing this loses my Airport connections. I share your prob regarding the DCHP beginning and ending addresses. Have you found a solution yet? so, my connection sharing is set to “Off (bridge mode)”. It seems contrary that you would set this to “share a public IP address” – what does this do and once you have reconnected, do you reset this back to the off mode? I got the message on our Mac server today. The server is on a well secured, wired LAN network and behind a proxy server. Our local network (3 mac-pros connected to the mini-mac server) immediately crashed. as long as no one else is sharing my stuff..
Im still havin trouble ive tried the steps but when i get to step6 it shoes no green light i have no router just a box woth two antenas not sure if its the router lol the apartments i live in provides the net. Ive tried unplugin it but to no avail pls help i have macbook pro running of just wireless with full bars but it goes in n out an gives the device network ip already in use warni g!!!!!! Go to System Preferences > Network > WiFi Must be selected then click Advanced button. Click OK button. Your Done! Try to sleep/shutdown your mac, when it wakes up try to surf. Your already connected. You don’t have to reset/turn off and on your router. This worked for me when trying to connect with a new install of Lion on a second machine. What if u see this message and ARE in a public place, like a coffee shop? I am having the same problem. I am not using airport or wi-fi. I am using ethernet. I rebooted the router, it did not help. The other computers (PCs) on the same router are okay. After reading some of this, I am thinking that connecting via ethernet is the cause of my problem, since I got this message as soon as I plugged it in back at home. I used the Network Assistant and it told me to contact my provider. I got this box up at my computer, and the network disconnected. After a restart it was up running again, so I thought this was not a problem. But since this was such an odd box ive never seen before, i screenshooted it. A month later, when I got my internet bill – I completely chocked! I had expanded my consumption with $ 2800, and could not believe it! Ive never did it before in a year! I called my internet company, and they told me that all this was used in one day. One day! And that day was one week before I got this message up on my mac, and that day I was on vacation without my computer: someone had hacked my IP address. That screenshot I did, saved me from paying all the expenses! Resetting my router worked for me. Thanks. All of these did not work for me. This may be a problem with my Time Capsule. They default to Bridge Mode, when they should be set to DHCP and Nat. This is in the documentation exactly nowhere. Go to Airport Utility. Click on the icon for your Time Capsule. Click Edit. Choose Network. Change Router Mode to DHCP and NAT. There will be an error code: DOUBLE NAT. Select IGNORE. I had that message pop up as well. The only way to get rid of it was to click “ok”. In a minute or so, out of nowhere a file downloaded to my dl folder. It had “.htm” at the bottom of it. I sent it to the trash and emptied the trash. By the time I did this, another “.htm” went to the dl folder. I sent it to the trash also and emptied it. My computer is the only one at my house and I have no iPhone or i-anything. So what happened? Was I hacked? I wasnt on airport or wi-fi and am on a wired network with just a modem. Same here. And I keep getting this error much more often then every other day – a couple of times a day, for sures. someone has managed to spoof your MAC address and IP and is attempting to gain access to your network, I am sure 100% I change normally IP Address in network preferences but it doesn’t work because someone spoof it and when I change it he has the new address please help me , what can I do.Please help me . . . I am living in a university dorm (and therefore have no access to the router, just my ethernet cable). The problem goes away when I connect with wifi but I prefer to use ethernet as the connection runs faster (roughly sixty people use the wifi on my floor alone). I have never set up any sort of network with my ethernet and as far as I am aware all of my security is up to date, so is someone possibly using my network? A few weeks ago when the problem was more consistent, I would click on the symbol for my ethernet connection and it showed “Gordon PC” as connected (no one on my floor has that as a first or middle name or anything resembling it and most people are using macbooks), this has disappeared but the problem with someone using my IP has returned. When I reset my IP (I have tried this method and manually resetting it) the problem will go away for several hours to days but returns. Someone else on my floor was having a similar problem but did not have the “Gordon PC” connection (which when I clicked changed the dimensions of what was visible on the screen and made the cursor larger and grainy). I got the same message this morning. i was freaked but I did look at my Iphone and my macbook ip address and noticed that they are the same. I guess that was the reason for the pop up message. I have a problem. On two occations, I found my (I am on a contract with a limited amount of Internet data per month) data being used much too quickly, and then got the message that my computer shares an ip address with another computer on my network. I am not on a network. Only one computer should use my data. This tells me that another device close to my home takes my ip address and pretends to be on my network, then steals my data. (I live in a flat, close to many people around, above and below me.) I do the ipconfig thing, but it happens again. How do I tell my modem that I am not on a network, he should not share data with any device except the one computer – mine – I connect him with? I do not give out my passwords at all. I have had this issue for sometime and finally resolved it this morning. I am running Parallels and due to a work configuration issue set the network mode to ‘Bridged’. The network then sees two devices on the same IP and the conflict occurs. The default network mode is ‘Shared’ which does not cause this issue. So for me the solution was to revert to the default ‘Shared’ mode at home. Hope that helps someone.